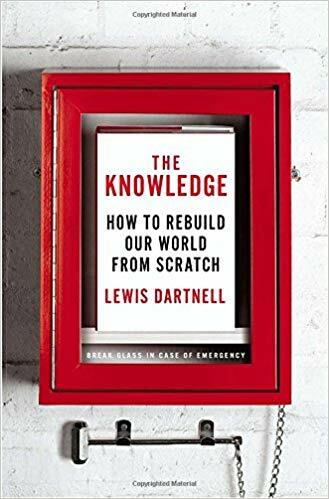 Book: The Knowledge: How To Rebuild Our World From Scratch, by Lewis Dartnell (The Penguin Press: 2014), 340 pp. At one time, preserving knowledge to rebuild our civilization played a larger role among survivalists than it seems to today. Some of the older survival guides--those books that tried to briefly cover all aspects of survivalism--often at least mentioned the importance of acquiring books and materials for home schooling of children after a nuclear war or whatever disaster would occur, in order to assist in rebuilding civilization. During a reboot, there's no reason to retrace the original route to scientific and technological sophistication. Our path through history has been long and tortuous, stumbling in a largely haphazard manner, chasing red herrings and overlooking crucial developments for long periods. But with 20/20 hindsight, knowing what we know now, could we give directions straight to crucial advances, taking shortcuts like an experienced navigator? (p. 11). His answer is yes, and he discusses such shortcuts throughout the book. In fact, he asserts, rebooting along the same trajectory may be very difficult or even impossible because the most easily accessible sources of fossil fuels that powered the industrial revolution--coal and oil--have been depleted. As an example of a shortcut, long distance navigation of ships requires the determination of latitude and longitude. Latitude can easily be determined by primitive means and simple mechanisms, such as a sextant. Longitude, however, was difficult to measure until the development of accurate chronographs showing you the time at a fixed longitude (e.g., Greenwich) against which could be determined local time, and, thus, giving the difference in longitude from the fixed location to the current location. Accurate mechanical chronographs can be difficult to not only develop but to manufacture. But by broadcasting a signal over relatively simple radio sets, a civilization could skip (or at least postpone) having to develop the complicated mechanical chronograph in favor of a simple radio receiver. The book is split into chapters which, after a couple of introductory topics, cover particular aspects of technology: agriculture, food and clothing, substances, materials, medicine, power, transport, communication, advanced chemistry, and time and place. Finally, he addresses the economic factors necessary to make the leap into the industrial revolution and the important of the scientific method. The first chapter discusses how humans might die off and discusses the impact on the natural and artificial environments. Chapter 2 discusses methods of scavenging basic resources after a collapse until you can rebuild some semblance of a society. In this, he discusses shelter (including that most modern structures will be unsuitable for occupation because of the inability to safely have fires, lack of easy access, and access to water), sources of water, and discusses some of the aspects of scavenging food, fuel, and medicine. Chapter 3 discusses agriculture, including the most useful types of foods, soil, tilling and harvesting. rotating crops, and using natural fertilizers. Chapter 4 continues this discussion by discussing methods of preserving foods and preparing cereal crops for use, before moving on to the basics of producing cloth. Chapters 5 and 6 are where Dartnell begins to get into technologies and techniques that we might associate with more advanced cultures, specifically, how to make lime (and its uses), soap, wood pyrolysis (the basic of a chemical industry to make products such as methanol, acetone, acetic acid, and other useful products), acids, clay, techniques for smelting and machining metals, and making glass and glass products. Chapter 7 covers the topic of medicine, including germ theory, childbirth (in particular, describing birthing forceps which was a huge development), medicines and microbiology. Chapter 8 is about power, Dartnell first discusses various methods of producing and transferring mechanical power, before moving on to electricity. Chapter 9 is about transportation, including the internal combustion engine. Chapter 10 covers the topic of communication, starting with writing and printing, before moving on to electrical and radio communications. Chapter 11 covers more advanced chemistry, including fertilizers and explosives (they are related), photography, and the basics of industrial chemistry, including some methods to produce certain of the chemicals discussed in Chapters 5 and 6, but on large scales. And Chapter 12 discusses how to determine time and location. The final chapter is entitled the greatest invention, but actually covers three basic topics. The first is economic factors that allowed Europe to catch up and bypass China--originally a much more advanced civilization. For those that are fans of Jared Diamond, I am sorry to say that it does not involve guns, germs or steel. Rather, the important factors, particularly in England, was a combination of high labor prices and cheap capital that incentivized investors to put up the money for building factories and developing mechanical substitutes for labor. Dartnell warns that "there is nothig inevitable about a sustained trajectory of scientific development or technological innovation, and even vibrant societies can lose the impetus to advance further." (p. 276). His example in this regard is China, which, "[b]y the end of the fourteenth century, ... had achieved a technological capability not seen anywhere in Europe until the 1700s, and seemed poised to initiate an industrial revolution of its own." (p. 276). Instead, China stagnated and "no further significant technological advancement occurred, and, indeed, some innovations were subsequently lost again." (p. 276). I would note that this was not the first time it happened to China, and you could see the same if you went back to the early part of the first Millennium. But there was another factor at work, as well, which was the scientific method. And Dartnell ends his book discussing the scientific method and explaining how you could build instruments for quantifying the environment (e.g., barometers and thermometers). If I were to try and sum up this book, I would say that it provides a roadmap for rebuilding civilization, but not detailed instructions. For those of you that grew up before GPS systems, I would compare this book to the state highway maps or road atlases of yore that only showed the most significant intercity highways and roads, with perhaps an inset or two to show more detail of a few of the larger cities. I think it succeeds fairly well in accomplishing what the author set out to do. And, in addition, it has an exhaustive bibliography of other sources. If it has any failings, it is that is lacking in explanation of key mathematical or arithmetical principles or double-entry bookkeeping (itself a revolutionary development). I would have also liked some additional information on identifying sources of key minerals, either from a view of how to spot it in the field, or listing some of the locations where large deposits are known to exist. In conclusion, while not necessary to one's immediate survival following an civilizational collapsing event, it still should be on the bookshelf of anyone that is prepping for such an event. I also believe that this book would be of interest in anyone interested in low-tech technology or the history of technology.